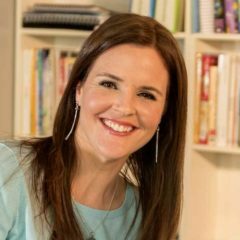 Understanding the Voice of Judgment can help teachers and individuals support their own, and others', creativity, confidence, and growth. Last fall I was enjoying a brisk walk through the heart of my hometown Chicago on a blustery day. Glancing at the Marshall Field’s (I refuse to admit it is now Macy’s) holiday windows, something surprising caught my attention. It was a man holding a sign that read, “Not begging. Jokes for $0.25. Jokes Jokes Jokes Joke Man.” A smile spread across my face. “Now there’s creativity in action,” I thought as I approached the guy, put a dollar in his cup, and listened and laughed at the four jokes that I had purchased. In the moment, I recognized the courage it took to express his uniqueness through his work, and I wanted to reward that creativity by supporting his ideas. As I reflect on the experience, there were a number of conditions that had to be present for the Joke Man’s strategy to succeed. The important ones have to do with what Dr. Jim Friedman, Ph.D., professor of creativity at the Miami University Farmer School of Business, calls the Voice of Judgment (VOJ). In this case, the Joke Man had to first overcome his own VOJ when considering how he would differentiate himself in Chicago’s competitive panhandling market. He had to silence the VOJ that might have whispered to him that he didn’t have enough jokes, or that his jokes weren’t funny enough, or that it would be easier to toss his sign and beg. Friedman first learned of the term Voice of Judgment (which other writers have called the “inner critic” or the “negative news network,” among a myriad of terms) in the book Creativity in Business by Michael L. Ray and Rochelle Myers. He believes so strongly that individuals need to understand their own VOJ that he devotes an entire class session to the topic, and assigns students a significant project that helps them address their own VOJs. He says that the tendency of students is to want to kill the VOJ, but instead he helps them understand how it can be helpful to them to support, but not stifle, their creativity. But even if you know how to handle your own VOJ, what about the effect of other people’s VOJ on you? For the Joke Man to keep his own VOJ in check, something else had to happen. Potential customers had to silence their own VOJs that may have told them to keep walking, or that it might be embarrassing to linger too long listening to a panhandler tell jokes on a busy Chicago sidewalk. It is often the people around us that solidify our own harsh judgments of ourselves through negative or skeptical feedback. When teaching for meaningful creative learning, there is always an element of the unexpected. Friedman encourages teachers to embrace the unexpected, to want to be surprised by students. He maintains that the future world, which none of us can imagine, needs people who don’t all come up with the same one answer. We need people who can find the unique answers that lead to innovation, and that’s what he encourages his students to do by digging deep into themselves to bring their own creative perspectives and ideas to assignments. 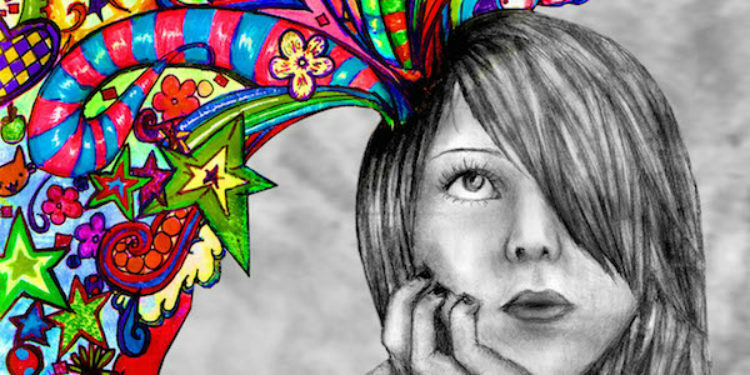 But how can a teacher prepare himself to respond to a student whose ideas seem wacky and far-out, or unlike what the adult envisioned? Some have successfully used an improv technique called “Yes, and . . . .” The key in the improv game is to always keep the dialogue alive by saying “Yes!”, an affirmative, and then adding to it. A negative reaction might shut the other actor down, and destroy the show. We don’t always realize it, but in our classrooms, negative reactions to students’ creative ideas or output can last for decades. Instead of shutting down ideas or rolling our eyes, teachers can make it a practice to respond “Yes, and . . .” to student comments, even if they are unexpected. As I paused on State Street after my interaction with the Joke Man, I noted that there weren’t many people taking him up on his offer. Were they listening to their own VOJs? Even worse, were they snickering at him and bringing on his VOJ? I hope that enough people have bought a joke to make the Joke Man keep up his act. It takes courage to be oneself and to offer up one’s original ideas. But it also takes a “Yes, and . . .” from those around us to help keep that VOJ from an ongoing dialogue of self-doubt. 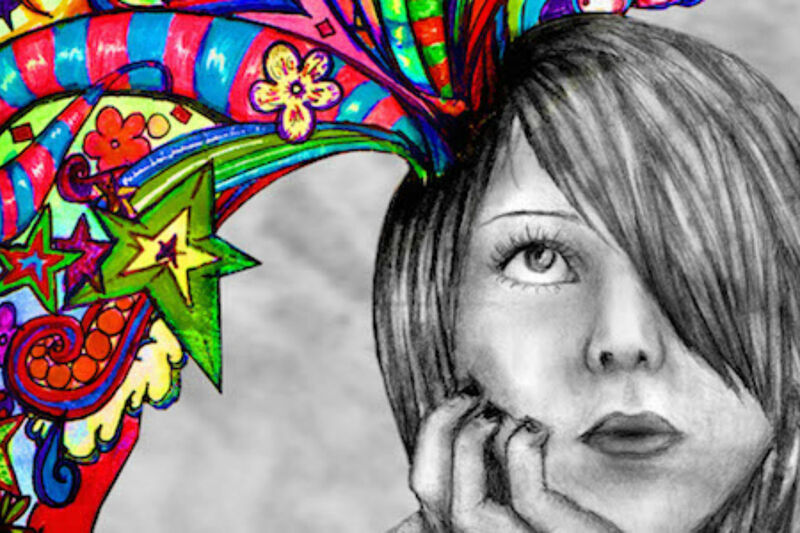 Where might you apply the “Yes, and . . .” paradigm in your life as a tool to help nurture creativity? 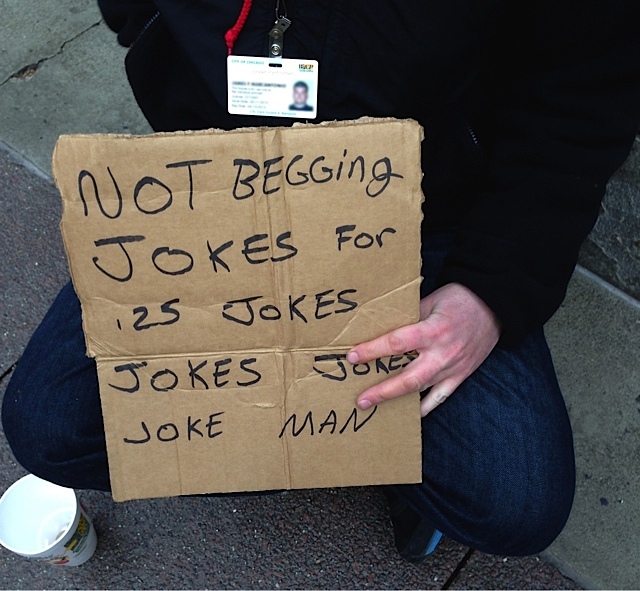 Photo credit: Kathryn Haydon, The Joke Man poses with his sign on State Street in Chicago. Copyright 2014 Kathryn Haydon. All Rights Reserved.